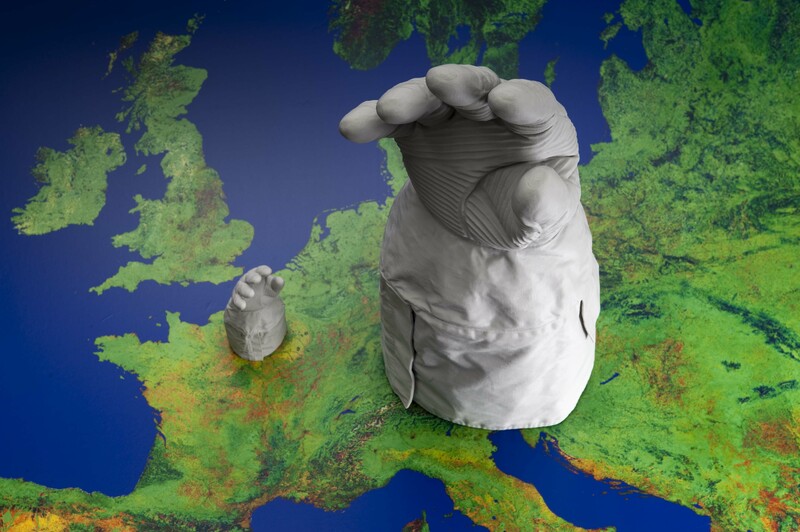 The European Space Agency (ESA) is investigating the potential of additive manufacturing (AM), or 3D printing, to transform how space missions are put together, and has identified ten ways. 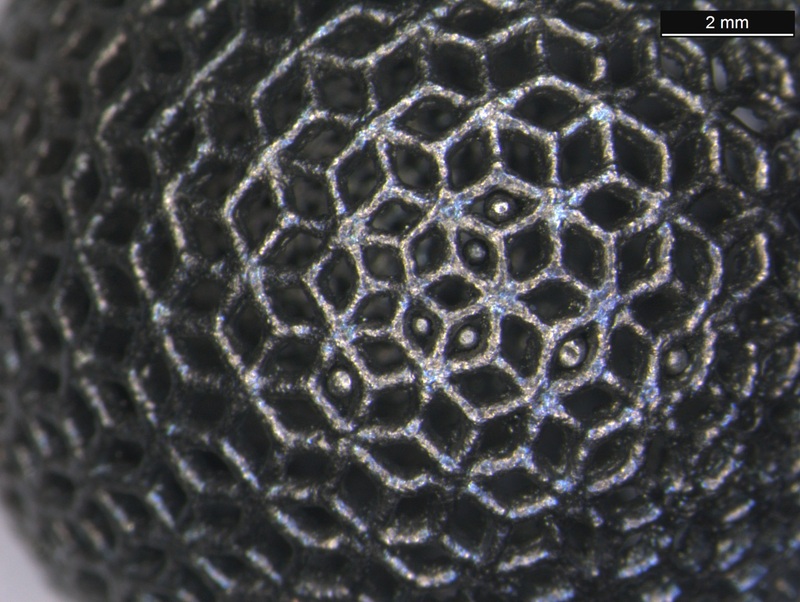 This titanium-lattice ball is a good example of additive manufacturing capabilities. These hollow balls have a complex external geometry, making them incredibly light while remaining stiff and opening up possibilities for future space applications. They could not have been manufactured as a single part using a conventional manufacturing process. 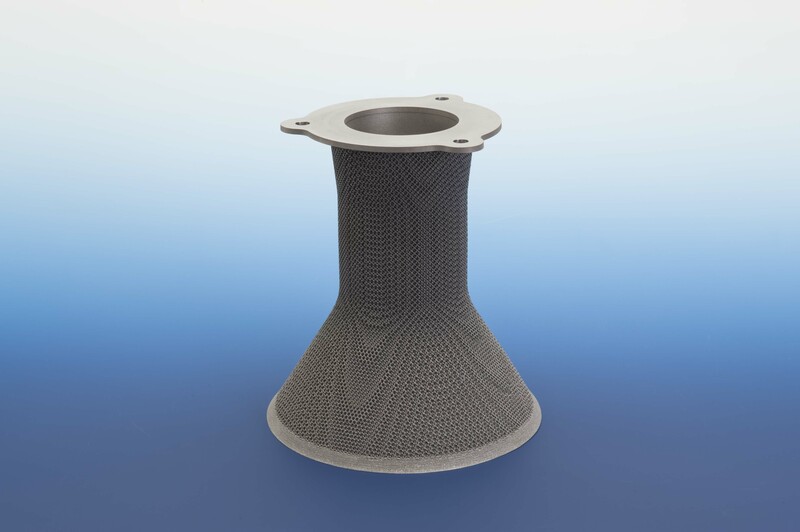 Instead of standard “subtractive manufacturing” — where material is cut away from a single piece — additive manufacturing involves building up a part from a series of layers, each one printed on top of the other. The process starts with a computer-aided design (CAD) model, which is then sliced horizontally apart to plan its layer-based physical construction. Anything suitable for the printing process can be designed by computer then printed as an actual item, typically by melting powder or wire materials, in plastic or metal. “AM offers a totally different way of designing,” explains Laurent Pambaguian of ESA’s Materials Technology Section, coordinating the Agency’s AM research. “Traditional design rules are often linked to giving a cutting tool access to the bulk part — how do we remove the surplus material to produce the final item? “AM, on the other hand, doesn’t mean we do away with all restrictions, but we are moving away for the traditional ‘design for manufacturing’ approach towards ‘design for need’. Laurent believes that AM, if applied well, can overcome many problems manufacturing for space has traditionally faced: “Space is a low-volume industrial sector, we need a relatively small amount of parts, but very well made. So, for instance, we might require only several kilos of a particular material, but then find it is only available to be purchased in 10-ton bulks. Down on the ground, ESA engineers already make routine use of AM in various ways. Take the team at the Concurrent Design Facility, who use networked computer tools and multimedia tools for the rapid design of future space missions. They also have a plastic 3D printer at their disposal. 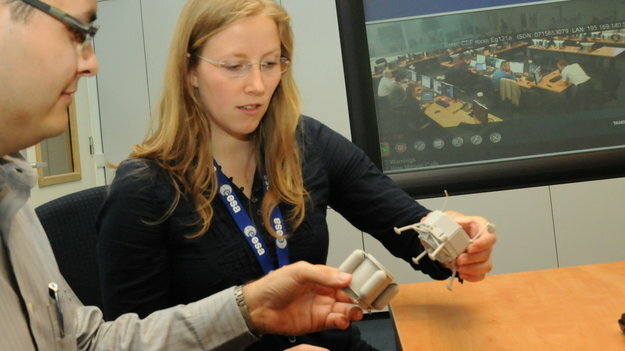 As a virtual spacecraft takes shape on the screens before them, the team can also pass around a scale model of the same design, made out of the same plastic as Lego bricks.And metallic 3D-printed parts commissioned from outside firms have also been used to refit or repair full-scale equipment in the ESTEC Test Centre, Europe’s leading collection of spaceflight simulation facilities under a single roof. But before AM parts can be employed on actual space missions, ESA’s materials engineers need to be confident that they can achieve the exacting quality levels needed. Back in 2009, when the Agency began this research, its starting point was to use AM to reproduce items that had actually flown in space. “The very first item we produced was a titanium copy of a stainless steel ‘woov’ (water on-off valve),” explains Laurent. “This has been flown on ESA’s Columbus Space Station module, as part of its plumbing. Follow-up test items included an antenna support strut, where mass was reduced by 46% and a radio-frequency filter with an internal silver coating — normally produced by bolting halves together — had its mass reduced by 50% and its manufacturing time slashed by several weeks. Its internal geometry was also made more wavy: the silver coating required to optimize its radio-frequency performance is far easier to apply than when dealing with sharp corners encountered in today’s state-of-the-art hardware. Such tailored design is another advantage of AM. ESA’s Propulsion Engineering section also took an early interest in AM, as a way of building the extremely complex shapes required by rocket nozzles and combustion chambers. “We began by remaking a showerhead injector, with complex internal geometry and more than a hundred separate welds,” explains Matthew Smith. The same kind of honeycombed lattices demonstrated by the titanium balls offer a way of reducing the mass and cost of rocket chambers and nozzles. The lattices can also improve thermal resilience, considering that engine temperatures can rise as high as 2500°C. Such lattices have a hugely increased surface area compared to standard solid items, enabling increased radiative cooling.Similar AM-printed lattices are also being considered as more durable thruster catalyst beds, which will escape the typical degradation in performance of standard pellet-based catalysts over a propulsion system’s lifetime.Carefully tailored AM lattices have also been investigated for “propellant management devices” — sponge-like elements inside a propulsion tank that help prevent bubbles and ensure steady thruster performance. The broader potential of lattices to slash the mass of future satellite structure is also being considered. We’re still a long-way from the routine use of AM parts in space. Problems like material post-processing, surface coating and ensuring the necessary precision geometries still need to be solved. And new qualification standards have to be written — but progress is being made. Occasional AM parts have already made it up to orbit: a 3D-printed plastic toolbox was flown up to Columbus last year. NASA has announced plans to fly a plastic 3D-printing machine to the Station. Meanwhile, ESA and the European Commission have embarked on a project to perfect the printing of space-quality metal components. The AMAZE project — Additive Manufacturing Aiming Towards Zero Waste & Efficient Production of High-Tech Metal Products — involves 28 industrial partners across Europe. How might AM transform space missions in future? 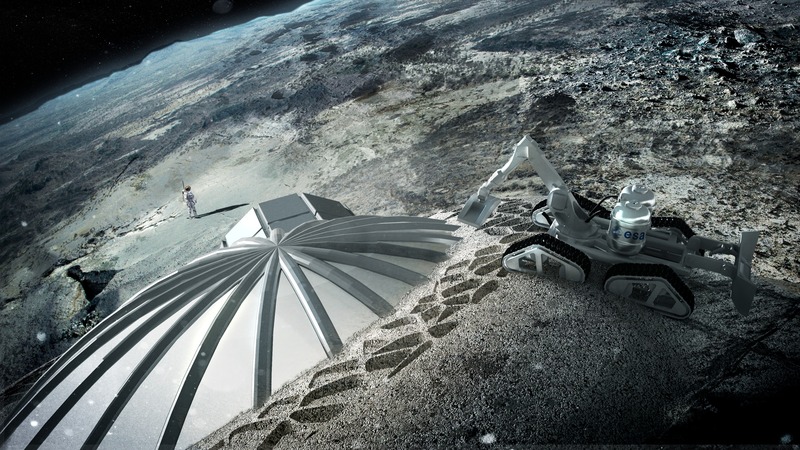 An ESA project to design a lunar base using 3D-printed local lunar rock demonstrates the broad span of its potential. Manned missions could carry a 3D printer with them to ensure full self-reliance as they fly many months or years distant from Earth. Any broken item could be quickly and easily replaced. This approach has already been validated by ESA by manufacturing and functionally testing parts that have required fixing during past manned missions, including screws, clamps and even plastic gloves. Or satellites in space could self-print new subsystems to provide new capabilities, in the same manner that today’s space probes are still having their software written on the way to their destination. Down on the ground, the possibilities are just as exciting: slashing the energy and mass needed for manufacturing could shrink the environmental footprint of the space industry hugely, the reason why AM is also of interest to ESA’s Clean Space initiative, which is tasked with reducing the space industry’s impacts on the environment.